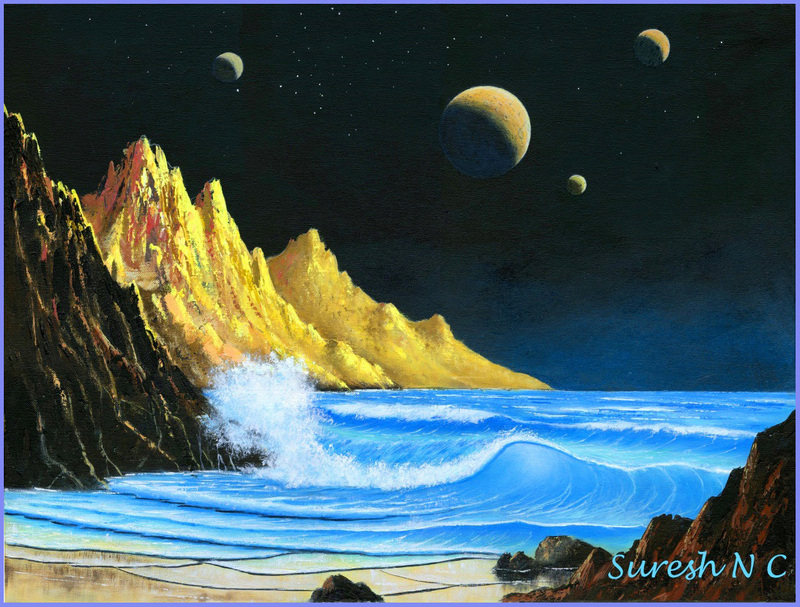 Space Art of Suresh N. C.
For Info/Order, please note painting number & click Order on Left. 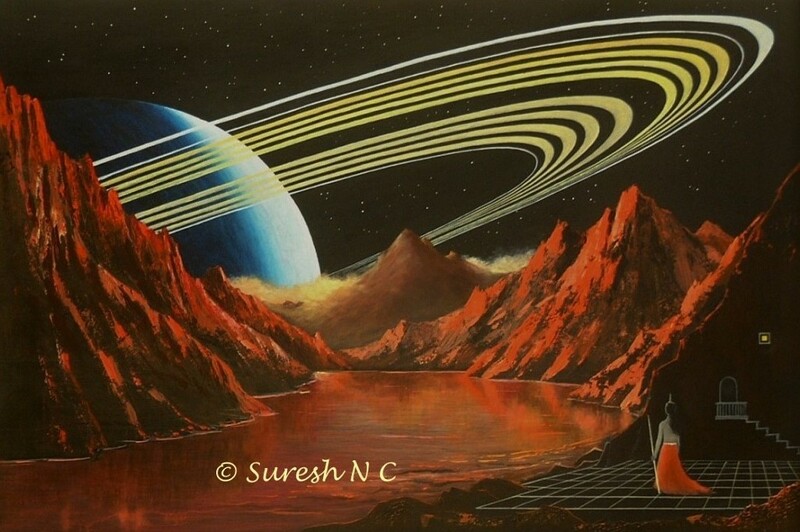 The view from the moon of a ringed planet in another star system. Four other moons of the ringed planet are seen rising as well. An alien princess has come out of a cave palace to spend the evening and watch the planetrise in solitude. 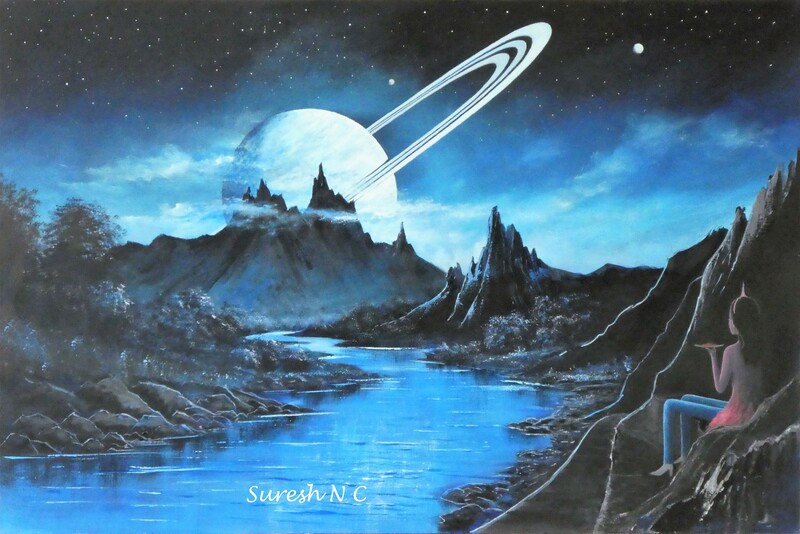 The princess comes here every now & then, especially after long political days filled with tiresome tirades from both the "Left" and "Right" on this Moon..
View from the moon of a ringed exoplanet, elsewhere in our Galaxy. It's an evening hour, and the ringed planet rises as a crescent on the left. An alien princess, on the lower right, has come out to watch the glorious planetrise. 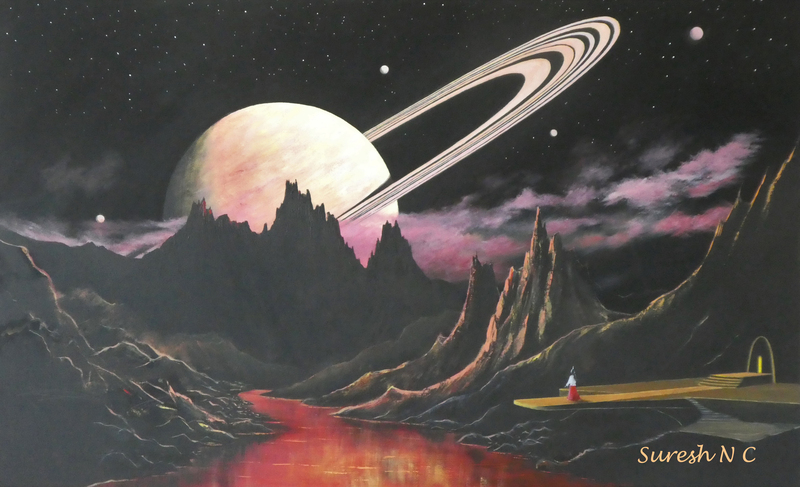 It's evening hour, on this moon of a ringed exoplanet, in another part of the Galaxy. 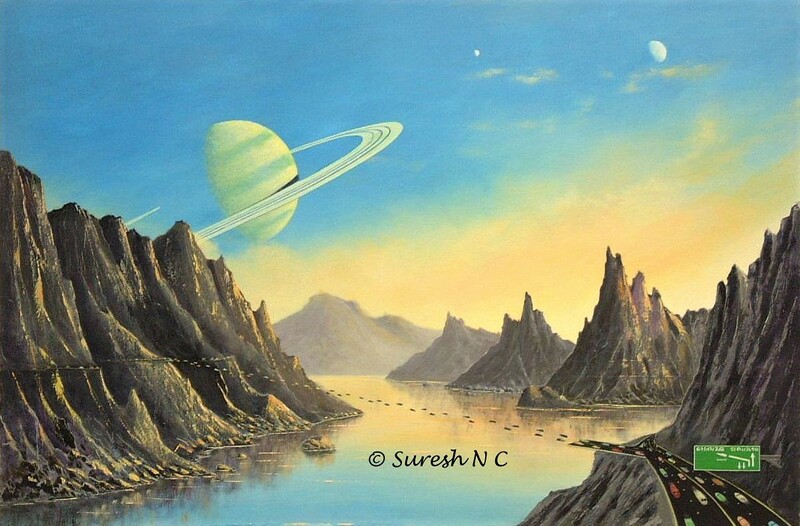 The ringed planet lies low in the South, while its "Sun" will set on the right in a few "hours". Two other moons of the ringed planet can be seen in the top right. Traffic appears to be fairly normal at this evening hour on the highways. Note the flying cars taking off from one lane in the highway on the lower right, and flying off to join a highway on the left. 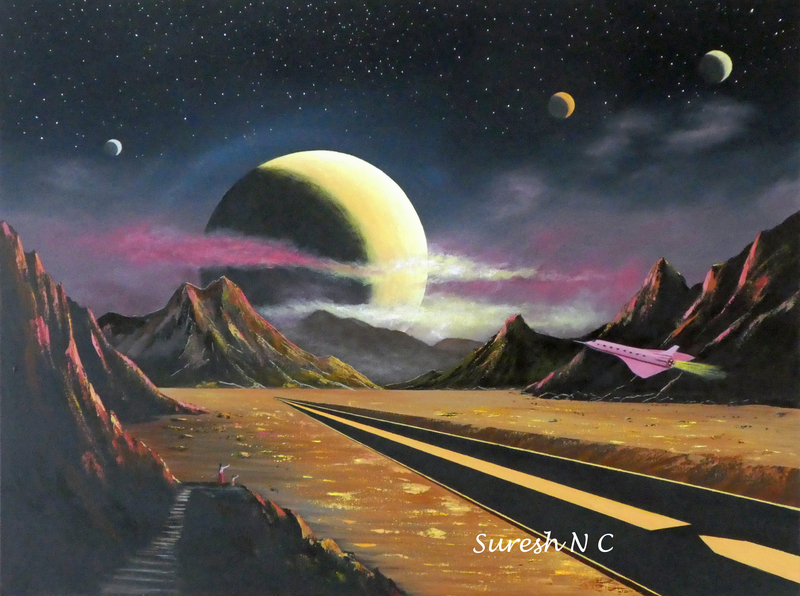 This painting was inspired by the flying car introduced by Terrafugia (http://www.terrafugia.com). It's evening hour on this exoplanet, and three of the many moons of this planet are rising in the West. Yes, West, since this planet rotates in a retrograde orbit, just like the planets Venus and Uranus in our own star system. 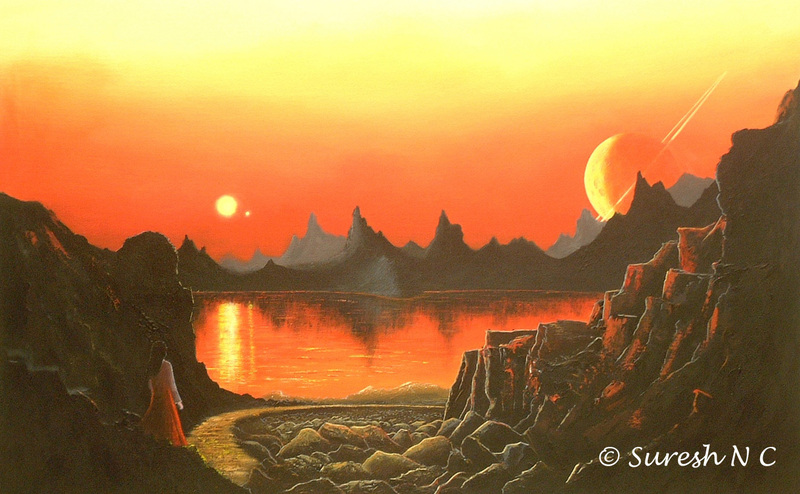 An alien pauses briefly to watch the rise of the three moons before commencing her evening stroll by the cliff-side. The three moons appear against the backdrop of the galactic band, just like our own "Milky Way" galaxy. 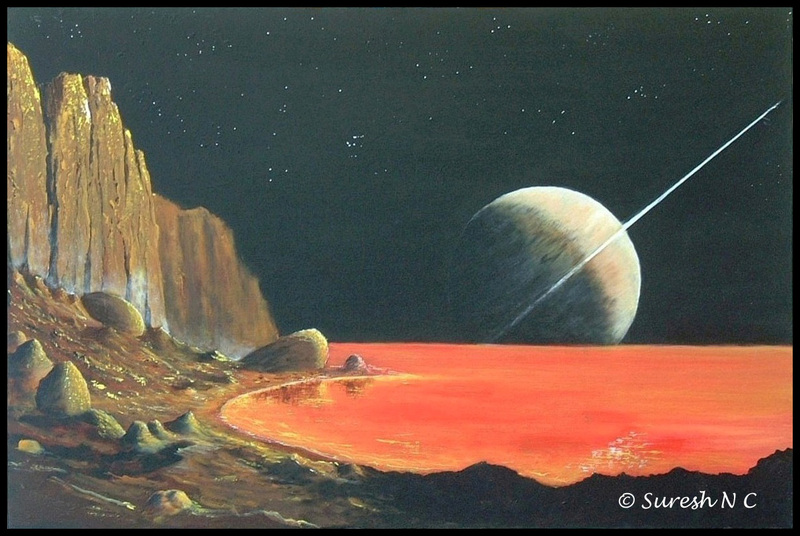 The view on the seashore of an exomoon. The mother planet of this moon rises, along with another of its moons, both as crescents. They shine by the reflected light of the parent star of this system (their "Sun") shining from the top right. View from the moon of a ringed exoplanet. Darkness has set in, and the big, ringed planet rises on the left. Two other moons of the ringed planet can be seen above, on the left and right, both showing up as crescents, like the planet itself. On the lower right, an alien is out for an evening walk on the mountain pathway. Seeing the rise of the planet and two other sister moons, it stops briefly to pray at a simple wayside shrine) . It's evening hour, in this river valley on an exoplanet. The slanting rays from the planet's star (its "Sun") come in from the right. 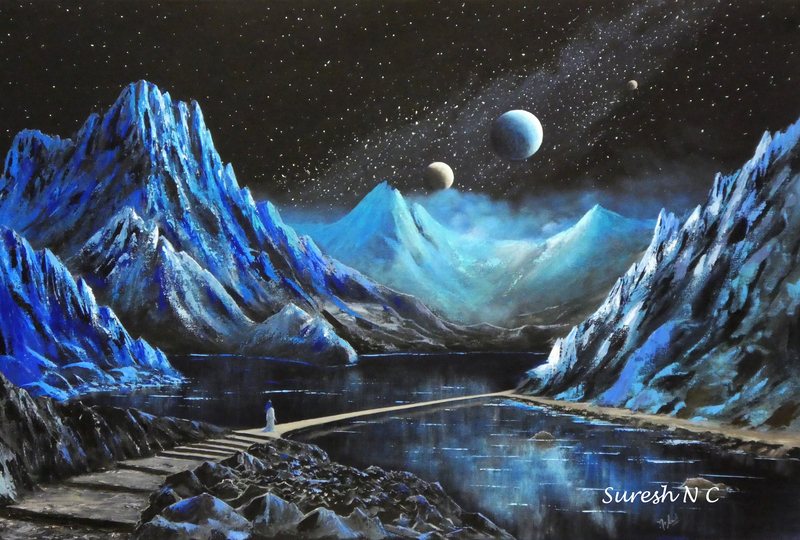 A neighboring galaxy rises beyond the far mountains. This planet is in the outer edge of its own galaxy, so the neighboring galaxy appears quite large from here. 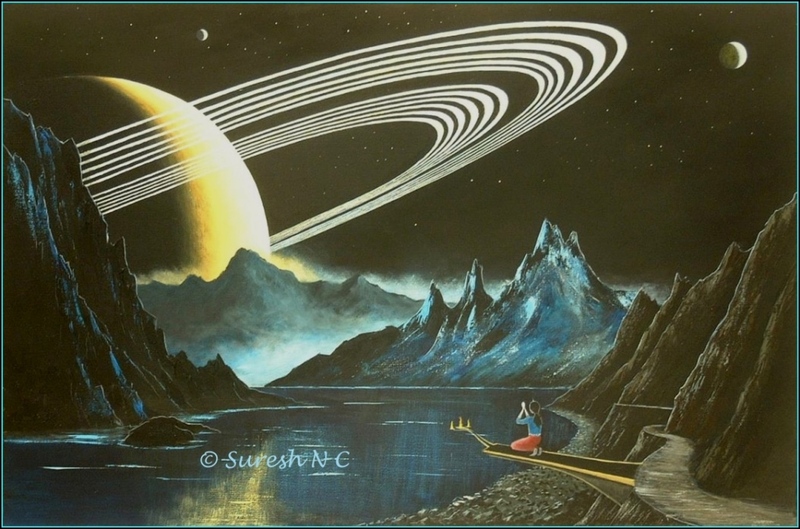 An alien watches this dramatic scene from an observation ledge below, before resuming her evening walk on the pathway along the cliff-side..
Three of this planet's many moons have risen beyond the far mountains. Lower right, two aliens have climbed up to the cave for a romantic lunch break. Both are workers at the chemical factory below, and this is lunch hour. A cargo aircraft takes off on the runway, while a nuclear power plant emits steam in the distant left. The factory produces a wide range of base chemicals for food items. Many centuries ago, these aliens were strict vegetarians. But now even plant & bacterial life forms are not killed as a food source, given the capability of producing all organic materials artificially.... Thus, the Primitive Era, when every life form had to kill & feed on other life forms for its sustenance, has come to an end on this planet ! An alien princess (lower left) often comes to this beach hideout after long political days. 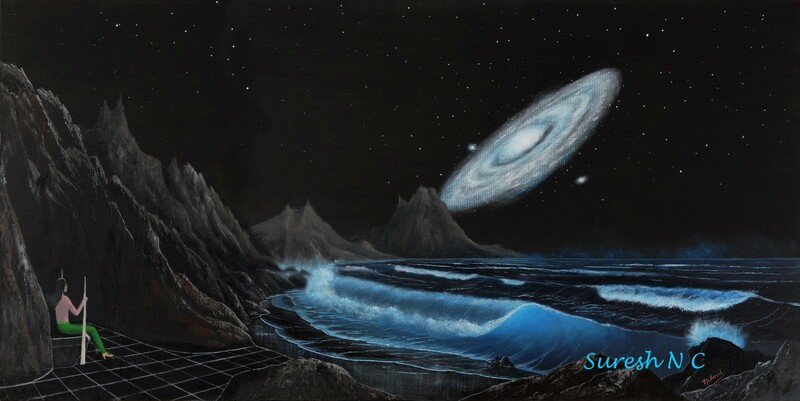 This evening, the neighboring Andromeda Galaxy is also seen rising beyond the far shores. . Prone to bouts of violent temper, the princess has discovered that watching the waves has a certain calming effect on her nerves. Soon she will assume full control of the planet and will have to deal with two troublesome political factions.. 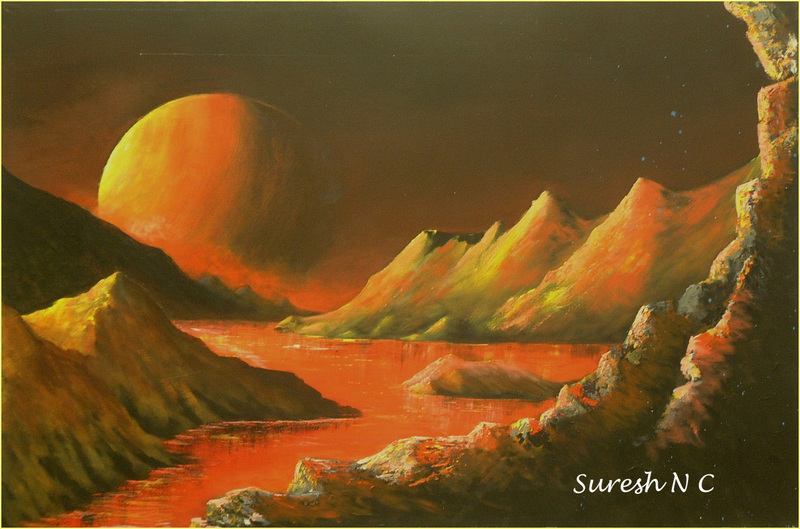 The painting shows the rise of a somewhat large, and close moon from an exoplanet. On the lower right, an alien descends the steps to commence an evening stroll by the side of the cliffs. Seeing the moonrise, she stops for a moment to pray, in line with the spiritual traditions on this planet. The Andromeda Galaxy (M 31, 2.5 million light years away) is our nearest spiral galaxy. From the earth, it is just visible to the unaided eye, but it actually covers an area larger than our moon! It should be even larger & brighter when viewed from the edge or outside our galaxy. 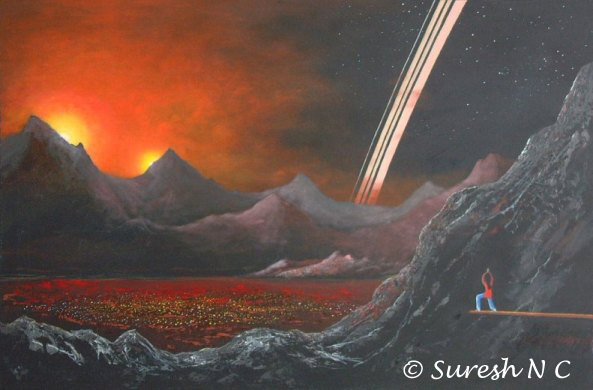 This painting shows the view from an exoplanet at the edge of our Milky Way galaxy. 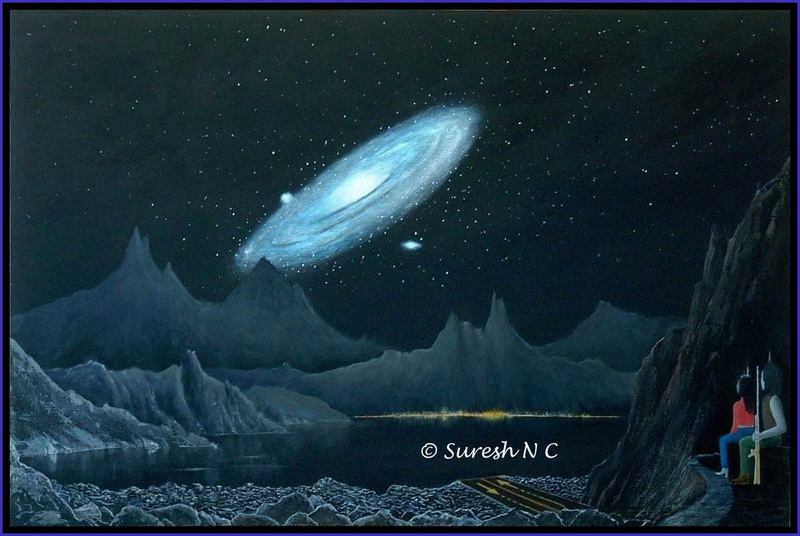 Two satellite galaxies of Andromeda, M 32 and M 110 are also shown. Lower right, an alien prince & princess watch the scene. The prince holds a quantum assault weapon, mindful of recent death threats from fringe groups opposed to monarchic rule on the planet. Down below, a small runway for spacecrafts can be seen, along with night lights from a township on the other side of the crater lake. 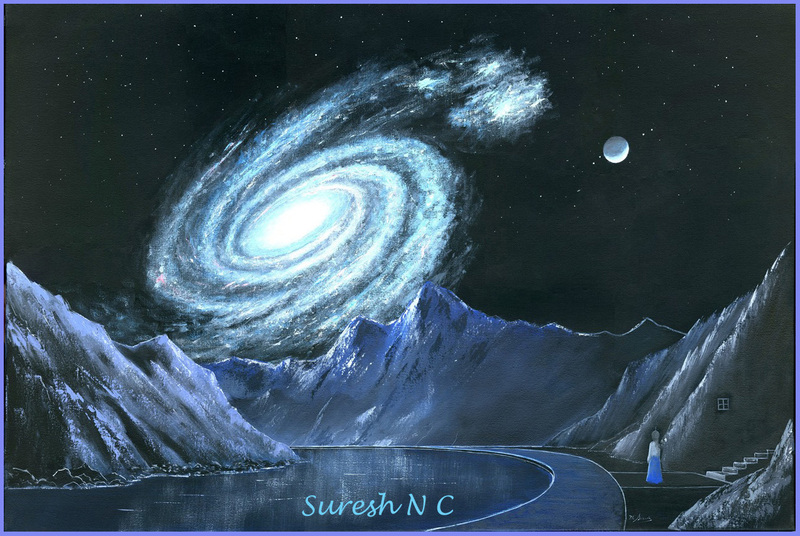 Of the 100 billion stars in our Milky Way Galaxy, more than one-third are in binary / multiple-star systems. 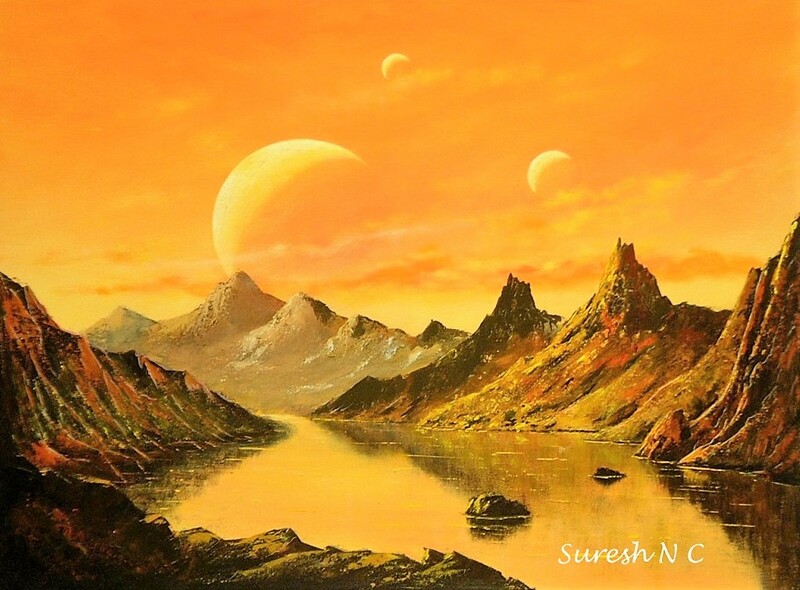 The painting shows the view from a ringed planet (like Saturn) in a binary-star system. The ring of the planet appears like a rainbow on the right, while the binary suns are seen rising on the left. 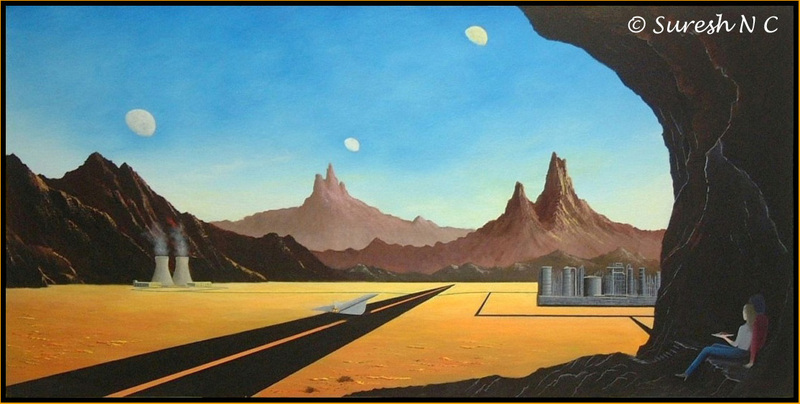 Lower right, an alien performs a sunrise worship ritual, conforming to the spiritual traditions on this planet. Down at the base of the crater, some street lights are still on; the crater settlement is yet to wake up to a new day. 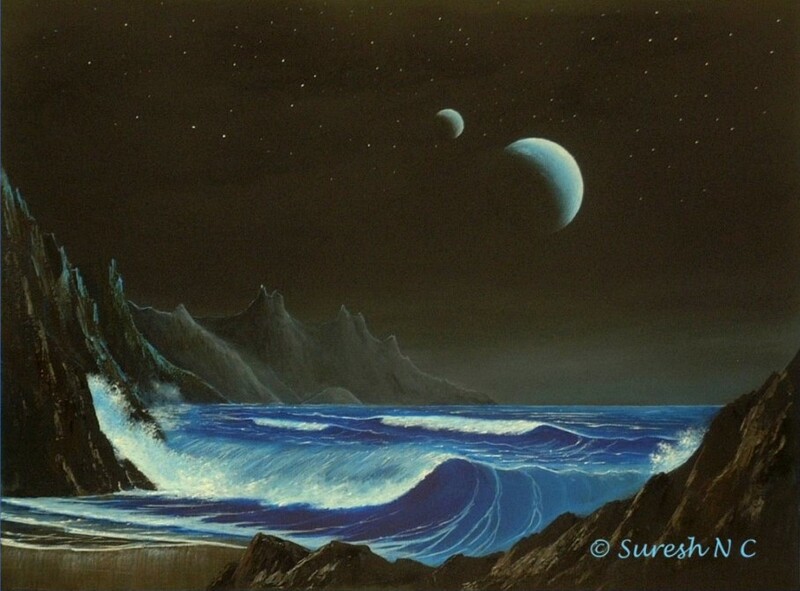 This painting shows an imagined view, a seascape on an exoplanet. 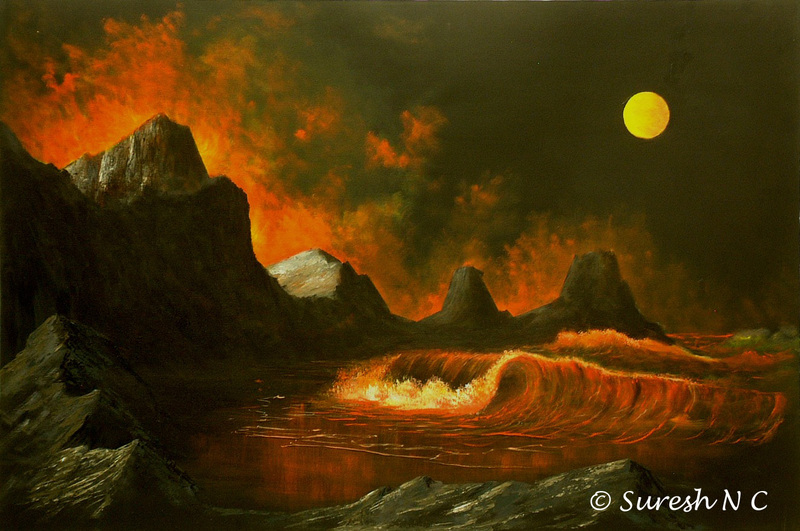 Some violent volcanic activity is taking place behind the hills on the left, while a yellow moon rises beyond the far waves. A sesacape on a low-gravity moon of a ringed exoplanet. 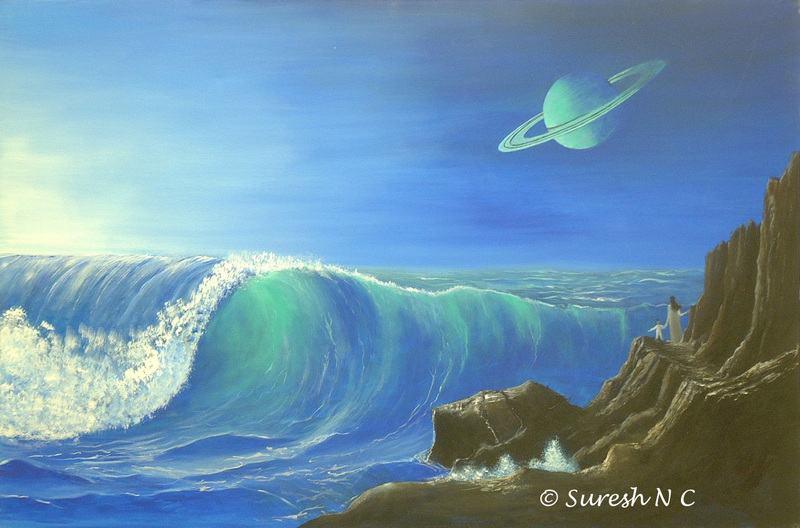 The waves are high due to the low gravity. 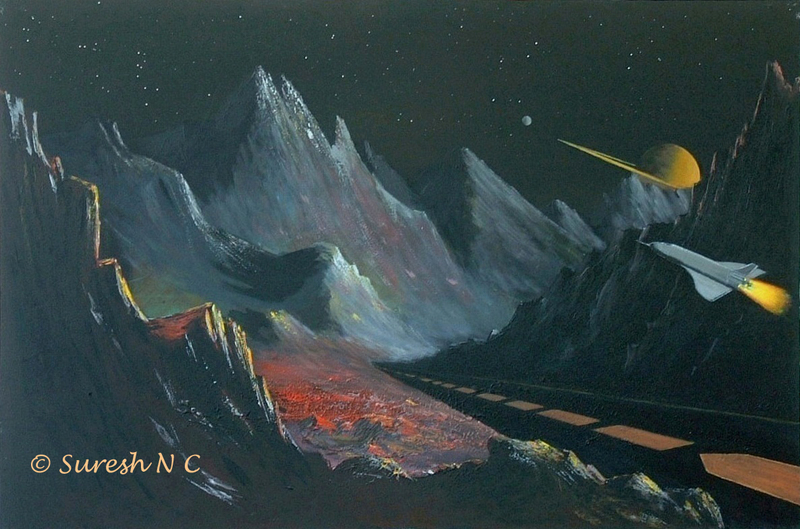 An alien mother and child watch the dramatic scene from a cliff on the right. 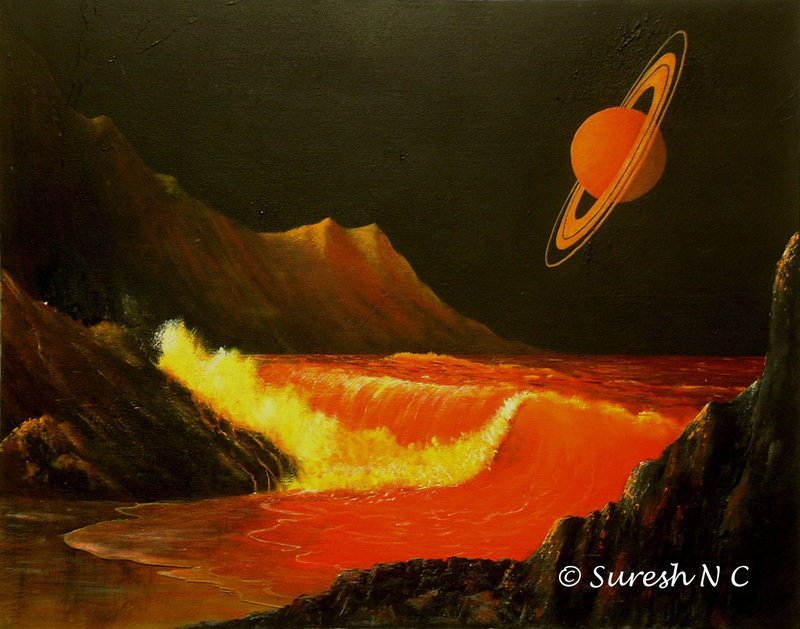 A seascape on the moon of a ringed exoplanet. Its afternoon hour on this moon of a ringed exoplanet. As the ringed planet rises, an alien princess watched meditatively from this cave opening on the lower right, well above the township below. 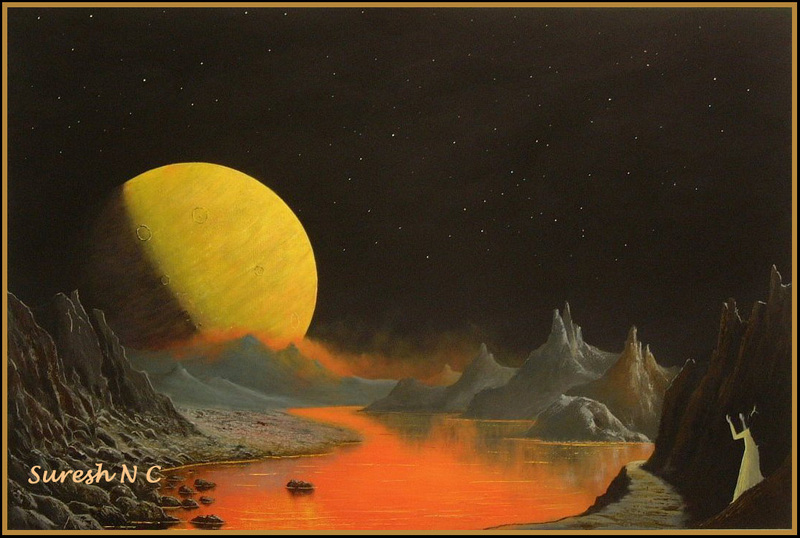 The painting shows the view from the moon of a ringed exoplanet in a binary-star system. The binary stars are seen setting on the left, casting a reflection on the crater lake. The ringed planet is shown setting on the right. Both the ringed planet and this moon orbit around the binary stars. Binary star systems are common in our Milky Way Galaxy: About one-third of the star systems in our galaxy are actually binary or multiple star systems. 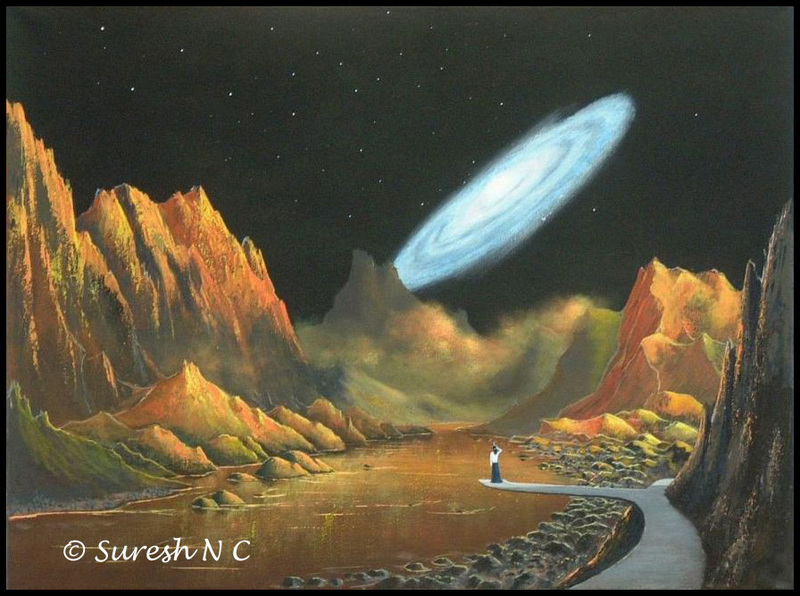 On the lower left, an alien watches momentarily before descending the steps, and commencing an evening stroll on the pathway along the shore of the crater lake. View from the moon of a ringed exoplanet. A spacescraft takes off on the right. 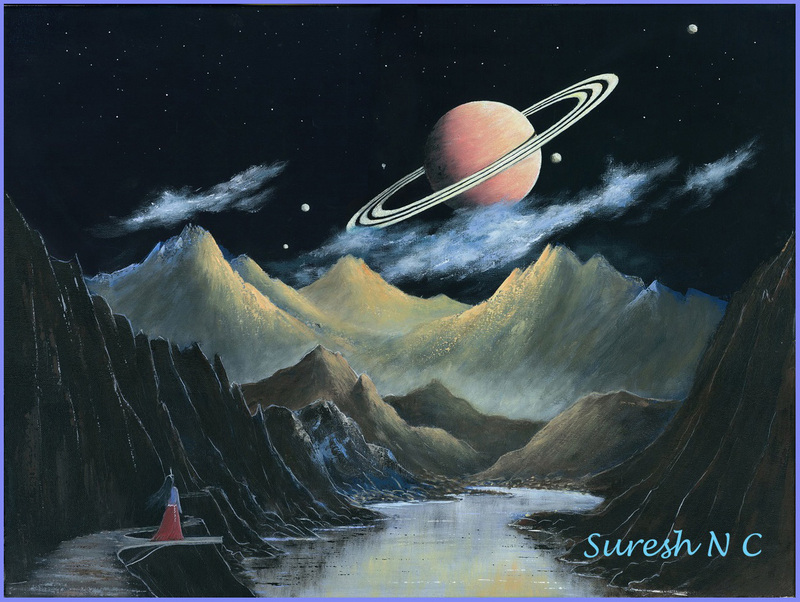 It has to climb quickly to reach heights above the surrounding mountains, while the ringed planet and one or two of its other moons rise on the right.